We've been juicing for several years now. I'm the chief juicer at our house. I’m going to talk mainly about using a VitaMix for juicing here. 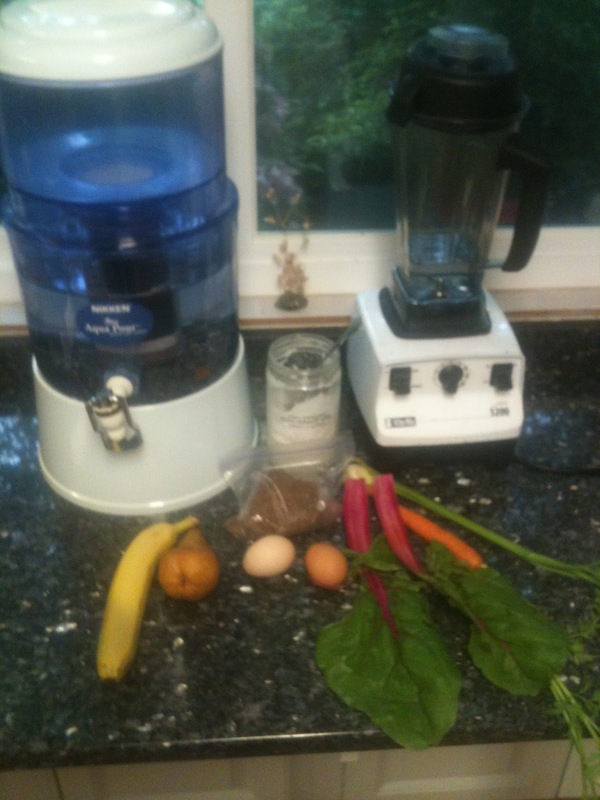 We tried using the Jack LaLanne power juicer and although it works very well, it separates all the pulp. In our case, we wanted the pulp. We still use the Jack’s juicer for specific tasks and there is a time and place for wanting juice without pulp. Although I say juicing, I guess I technically make smoothies. In our house, we always need to make enough for two so here we go. So what are our variable ingredients today for juicing? A banana, pear, celery, carrot, and swiss chard. Make sure you rinse off all your ingredients(can't have dirty food). From our experience from Jack LaLanne’s juicer, we should start with the softest first. But when I have a banana, I save it for later. So I quarter the pear. Put the water in the VitaMix and start it on variable low. Don’t forget the lid or you will be cleaning the ceiling. Add the quartered pear and the coconut oil. Because you want the coconut to melt a little you need to get it spinning very early. Now in goes the flax seed. Next I snap off the carrot top and throw the carrot top in the juicer. Yep, green stuff and all. You need to get over your preconceived notions of what is good and what isn’t. The carrot top begins to swipe away at the coconut oil. You will need to increase your VitaMix speed. A good rule of thumb is just under where the ingredients just start jumping. You will understand when you see it. Here comes the swiss chard. You may need to increase speed again. And now, the banana. Increase the speed again. Finally the eggs. Yep just crack them into juice just like Rocky would. You don’t want them to spin but maybe 10-15 seconds. Remember you can make hot soup using the VitaMix so you don’t want to drink scrambled eggs. Viola! Pour and serve. Two yummy breakfast smoothies. You may not always have a lot of fruit and that’s ok. As Americans, we have been over sweetificated so we need to tone that down a bit. Remember that carrots and beets (mmmm. Beet smoothie) have lots of natural sugar and powerful antioxidants.